It’s December. If you were reading last year at this time, you know what that means: time for me to start posting entries like crazy. I’ll be participating in Holidailies for the fourth time–it’s a Hat on Top tradition now–but that doesn’t start until December 7th this year. However, there’s something new to do right now: Tidings of Danger & Mayhem. Because I was busy yesterday getting ready to go the football game, meeting friends for an early lunch before the game (mmm, chorizo quesadillas), walking over the stadium and watching the game (and watching security confiscating the anti-Matt Millen signs), going out with friends for pizza (mmm, deep dish Papalis Gourmet) after the game, and watching NFL PrimeTime after getting home from the game, I missed the official opening day for Tidings, but fortunately Mayhem and Danger are kind and generous leaders and have made the rules flexible enough that I can catch up today without penalty. The first prompt: Winter Count for January. Skiing wasn’t the only thing I did this past January, of course, but it was definitely the highlight of the month. It was my first time in New Mexico and my first time at Taos Ski Valley and while neither was a perfect fit for me, I enjoyed seeing new things and skiing new slopes. I’m still sometimes surprised at how much I like to ski–generally I don’t like to be cold and I don’t like to exercise and I don’t like to do things when other people can see me when I screw up, but I get out on the ski hill and yes sometimes I’m cold and yes sometimes my thighs burn and yes sometimes I wipe out spectacularly in full view of everyone on the lift but that’s all okay. If that’s the price I have to pay to get the thrill of flying down a groomed slope or the satisfaction of picking my way through a tricky stand of trees, that’s fine. Not that I don’t ever get cranky on ski trips, because I’m still me even when transported to the mountains, but there are a lot more joyful moments mixed in there than in the normal course of business or even the normal course of vacation. 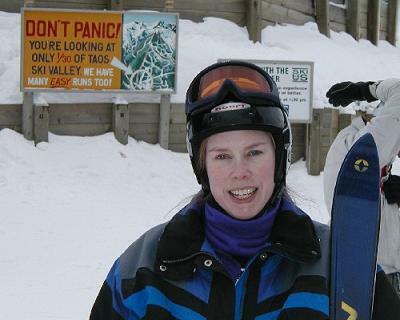 I can’t wait to get out on the slopes again this season. One year ago today, I didn’t write an entry. Why? I guess because Holidailies hadn’t started yet and I was saving myself for that. Or maybe I was just lazy. Two years ago, Holidailies was already underway and I shared my quilting to do list. Three years ago, my Holidailies contribution was writing about writing a blurb for Dale and Joan’s Christmas letter. We did this year’s last week (well, Mr. Karen did the actual writing; I provided editorial support).